Some of you may have already seen this on TV, but I would like to introduce an article about a very advanced two-legged robot, the revised ASIMO. 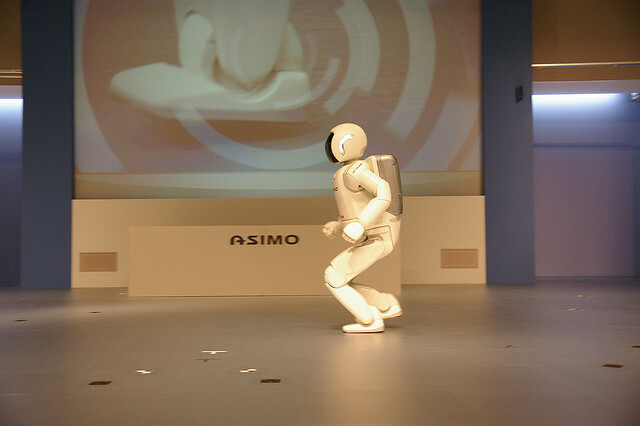 It was the first revision to ASIMO in the past 4 years. With more advanced autonomous mobility, ASIMO does not need human operator to move. Also, each finger can be moved independently, so that new ASIMO is capable to communicate using sign language. According to the article, its sensor enables new ASIMO to track and predict movement of people so it can avoid collisions with others. Unlike me, ASIMO even recognise multiple people speaking at the same time! Here is an official movie of the humanoid robot. I watched ASIMO pouring juice into a cup on TV, and was so surprised because the way he moves was just as smooth as we do! !